The Meat & Wine Co has been at Southbank for many years. My first time was at a 21st birthday seated upstairs. And on the recent visit, I sat on the ground floor for a girls night table for four. I felt that the ground floor was very cosy – the tables were close to each other. A bit too close? If you’re on a date, you’d probably want to be seated by the window. Service was great, the staff was very helpful in recommending how much to eat and what half rack looked like. 🙂 They came back to check whether the food was enough etc. On a monday night – it was a busy one – we were recommended to book. For drinks we tried two mocktails, Pineapple Express (left) and Greener Pastures (right) and a cocktail, Spritz Rose Lychee (bottom). Pineapple Express tasted like a light tropical drink with a hint of cinnamon floating on top. Orange, Pineapple, Apple Juices, Orange Bitters, Orgeat, Cinnamon – a tropical drink. Small mocktail for $8. Greener Pasture had Mint, Lime, Blood Orange, Orange Bitters, Soda. The girls felt it had too much blood orange. But I felt it was just right after mixing it. Garlic bread turned out amazingly tasty, the white truffle oil went really well with the garlic butter. The air-dried ricotta made it delicate and fluffy while biting on the crusty bread. The side we tried were husselback $8 and onion rings $7. A bit expensive for a small side. Husselback was very nice with the pepperback cheese and bacon sauce. Onion rings was a miss, although crunchy, I expected onion rings to be whole rounded rings. Unfortunately, they were more in broken pieces and didn’t have that onion aroma. Another side we ordered was the Pork Belly – pork skin was crackling and juicy in chilli lime. There is a kick to it. Their salad was beautiful – I think it’s because the Ponzu dressing that lifted up the freshness. 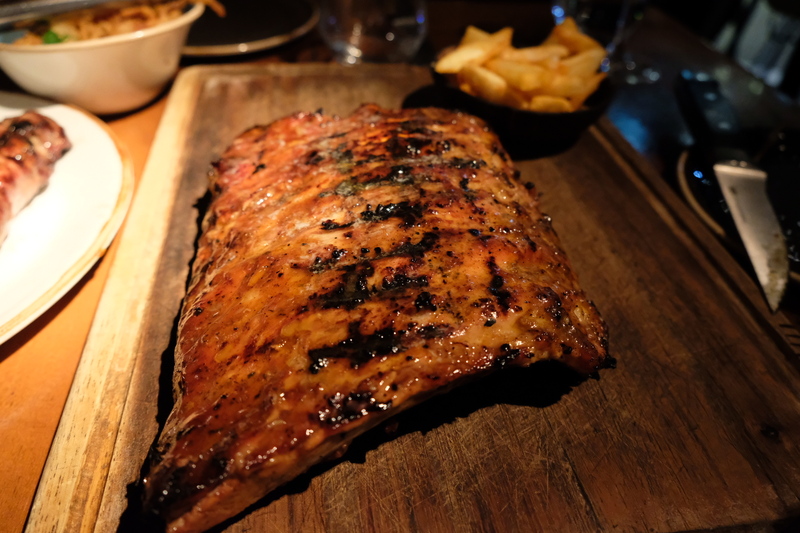 For mains, we ordered a Pork ribs half rack, $39. Each of us had two each. The ribs were tasty and juicy. We were provided with warm lemon water to wash our hands after digging in. Chips on the side were so-so. Lacked a bit of seasoning but crispy like wedges. The Short-horn New Yorker, $49 with Portuguese sauce, $4 and a side of salad is another main ordered. the steak by itself was good but not the best I’ve tasted for it’s price. Unfortunately I didn’t like the Portuguese sauce – spicy and creamy that overpowered the steak. The Portuguese sauce may be better with another protein. The side salad was yummy – vinaigrette dressing with cos lettuce and radish. We were just enough full from the above dishes, but who wouldn’t want to try dessert if we’re all sharing! Semifreddo was the better dessert over Apple pie. The Semifreddo was creamy and looked like an icy pole on top of the burnt meringue. I loved the burnt meringue – nice and smokey. The chocolate crumb was not too sweet and the raspberry gel were acidic enough to accompany the semifreddo. But where’s the matcha tea? I couldn’t visually see nor taste it. Apple pie reminded me of McDonalds apple pie – fried, it was sprinkled with sugar and smoked maple syrup underneath. I couldn’t taste anything smoked. But the apple pie was nice a warm inside and the mascarpone ice-cream was delicious. Overall, I’d say this is a fine dining restaurant, so expect to pay more for the ambience, thought and service. The bill turned out to be $50 each. It was very satisfying, but quite expensive for some hits and misses.